Let me reveal something to you…I’m a bit of a geeky individual… and growing up I was really big on playing playstation games. Even after I would complete a game, I was drawn back to replaying the story, to explore new things I hadn’t see before and to also earn trophies for completing specific requirements. Gamification is a seriously hot topic right now and a process that is becoming hugely popular within businesses, brands and Youtube channels. Gamification is the idea of turning a business into a game to drive engagement of consumers with that service. A great example of this is the Fuel Band from Nike. Users of the Fuel Band were encouraged to wear the band to record how much exercise they were doing in a day. To make the experience more interesting, users would compete with other users of the fuel band (which could be friends, family and even colleagues) and given digital trophies and scores for achieving daily targets. These would also be seen by other users to add a competitive edge, encouraging users to improve and compete with other people scores and improve on their own. The Gamification aspect here is to make exercising and fitness more competitive, fun and interactive. Let’s set the stage and say you decide to give away a free product or your own services as the prize. But the only way to stand a chance of winning such prizes would be if viewers subscribe to your channel, like the video and leave a comment to participate, simply because you’ve asked them to. If your videos are that impactful and engaging and leave your viewers wanting more, there is a high probability that they will act on this opportunity. Not only will this increase your popularity with your audience, but the Youtube algorithm will favour you as well. Part of the Youtube algorithm involves how active users are with your videos. If a video is getting lots of comments and likes, then not only will it help to rank higher in the searches, it will also stand a chance to be seen in the ‘Trending’ section of Youtube. For every one of your videos that is watched by visitors, rapport is continuously built over time between you and them. Having giveaways or encouraging user engagement adds bonus rapport to the equation and the more active and involved viewers are, then the easier it will be to upsell them to conversions. And in case you weren’t aware already, Youtube has released a new feature called ‘On The Rise’ where every day, new channels who put the effort into their content, and who have as little as 1k subscribers, can be added to the Trending page and promoted freely to their niche. Highly engaging videos with prizes will drive subscribers quickly and efficiently. I’ve seen some channels give away gift certificates, games consoles, coaching and more. Giving away prizes of such value is a great way to drive traffic and subscribers to you. The moment viewers see such value, especially if it’s to do with the niche they’re interested in, they’d be crazy not to participate in a chance to win something they want/ need. Now you might be wondering “How can I afford to give away such things?” well, as momentum sees your channel growing, you may find yourself in a position where sponsors come forward or you’re making good money via monetisation. You could either reinvest the money to pay for your prizes, or alternatively search for sponsors too. Its safe to say that this becomes a self-advertising investment. Many your viewers may not have won the prize this time around… but who’s not to say they don’t stand a chance to win next time. Although this wouldn’t be the sole purpose to drive people to watch future videos, it is something that keeps audiences coming back for more. It’s similar to why people continue to buy lottery tickets, they have to be in it to win it! Depending on the prize and the requirements to enter your competitions, subscribers may feel inclined to share your videos with friends and colleagues and persuade them to join in too. The more shares/ embeds that take place, the more the video is promoted to new audiences, causing your videos to surge in views. This of this as free advertising. An expert that I highly suggest searching for, and reaching out to, is an awesome friend and client of mine, An Coppens. An is an expert on Gamification and works with businesses and brands on incorporating the Gamification process into them. So if you are looking into encouraging productivity with clients, An is your lady! 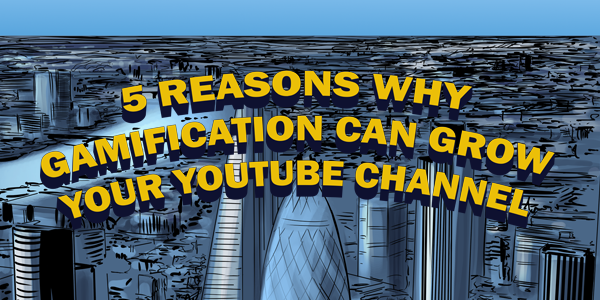 and Gamification is a must have for your Youtube channel, brand or business.